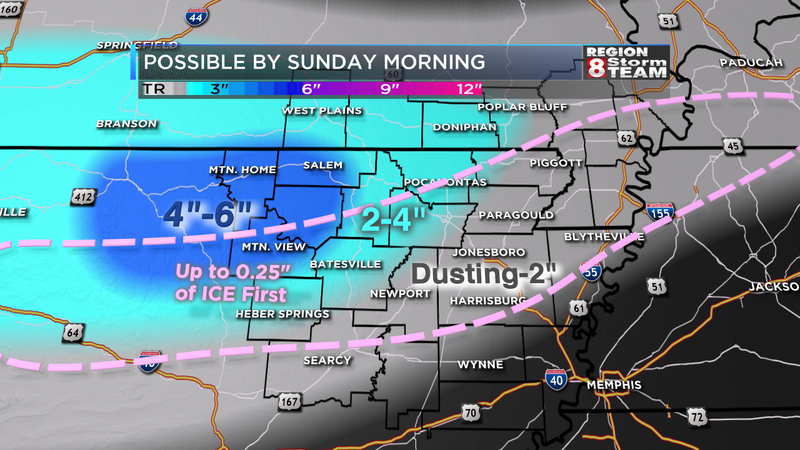 Ryan's Blog: Could We Get More ICE Than SNOW? Thursday Update. Could We Get More ICE Than SNOW? Thursday Update. The above map is my current thinking on accumulations, as of this afternoon (Thursday). This could easily change by tomorrow, so stay tuned. Rain starts Friday night into Saturday morning. Northern and western counties will quickly switch to sleet and freezing rain. By Saturday night, everything west of Highway 49 should switch to snow. If we don't switch to snow and stay as sleet and freezing rain, power issues increase and accumulations decrease. Counties closer to I40 will see mainly plain rain. If I changed anything in the forecast tonight, it would be to increase the freezing rain numbers and lower the snow numbers. As I said, it is still a little high on amounts! Stay tuned. VIDEO update can be found on my Facebook page and on our Region 8 Weather App.